One of my business goals for the year was to find and push the limits of my comfort zone. Now it may not seem scary to you, but I was in a perpetual state of terror last year when I was talked into drawing Skelekitty live and in public for last year's "Chalk It Up to Sacramento" festival. While there were a few snotty comments within earshot (rude! ), any irritation or humiliation I might have suffered was pretty short-lived, since the medium was chalk on sidewalks and therefore faded pretty quickly. 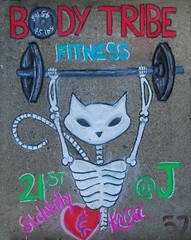 I'm not entirely sure if I'll be doing Chalk It Up again in 2010 - it will pretty much depend on whether I can find a good match for Skelekitty or one of my "Krissi's Art Studio" images. If you have ideas for a potential match with a local business, let me (or the business) know, OK? 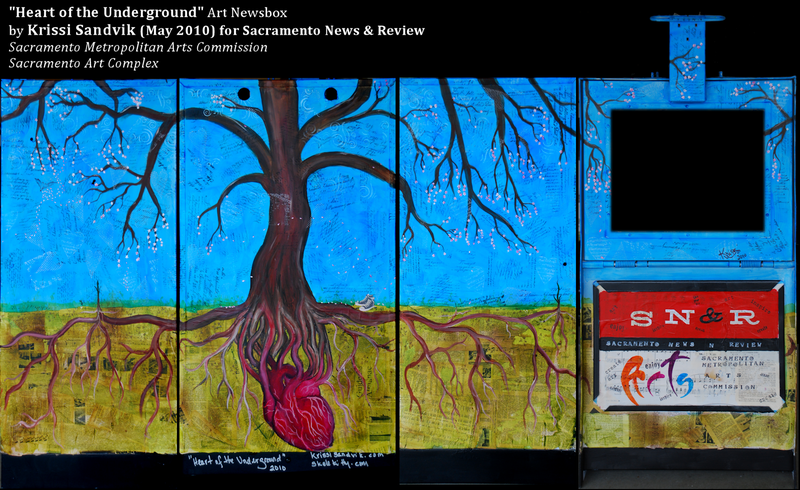 "Heart of the Underground" mixed-media art newsbox by Krissi Sandvik 2010. "My inspiration for this piece was the Midtown art & music scene, which is the heart of our City of Trees. Drawing on various cultural images, I decided on a blossoming tree of life growing from a heart. 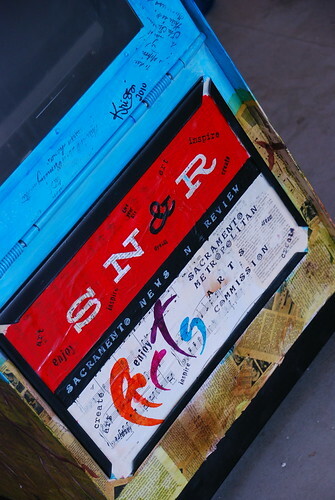 This symbol of the city is surrounded by layered images of newsprint, handwriting and sheet music on a blue sky." By the way, this dude is a paint chemist, so I had some well-placed faith in his approach. I used all of his prep/priming techniques and products (which I found easily in the automotive section at my local OSH) except that I did not bother to remove the original paint. I did, however, sand the entire box with a couple of medium grit sandpapers and a palm sander before spraying the first layer of self-etching primer. Rather than coating the box with a gloss white under the art, I replaced the sandable primer with a matte white primer by Rustoleum which gave me an even white surface that still promoted adhesion of my paints (yes, if you read the tutorial that is about 3-5 coats of just PRIMER!). The actual painting / mixed-media work was created using the same products and techniques I use on all my art (except for the pyrography). After all of the hard work I put into this, including hand painting all of those little flowers (10 brushstrokes EACH), I was sure to seal this piece with the automotive gloss sealer he also used on his project. Several coats. The entire project took most of a month to complete because of the huge amount of time for prep (1-2 days), the long drying time required by the glazing techniques I use and the fact that I'm SUPPOSED to have a life outside of my studio. I'd say there was probably about 60 hours of work that went into this when all was said and done. You can see the original along with boxes painted by other local artists this weekend at the Sacramento Art Complex "Art Happens at The SAC" benefit and fundraiser - 2110 K Street in Midtown Sacramento. UPDATE! My box is located on the corner of K & 16th Streets. In case you want to stop by and give it some love (i.e., peel off stickers that weren't put there by SN&R). I LOVE LOVE LOVE this project! I wanna be like you when I grow up, Miss Krissi! Thanks Alisa, but I think one of me is PLENTY. Besides, I love you being you!! What made you try pyrography?